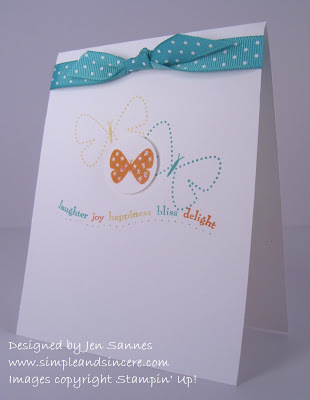 Simple & Sincere: CAS Challenge: Pop It Up! Happy Labor Day! Here is my first card for this week's CAS challenge is Splitcoast - Pop It Up! If you would like to play along, visit this thread to find out more and see the rest of the design team's examples. This is the first card I made for the challenge. 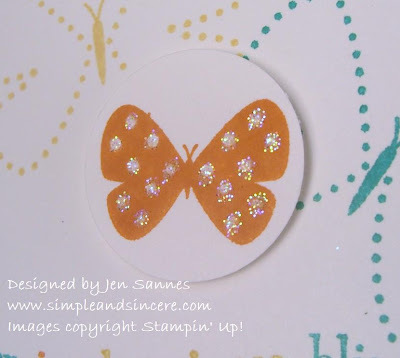 I popped up the Pumpkin Pie butterfly with a Dimensional. I think this may be my new favorite color combo - Bermuda Bay, So Saffron, and Pumpkin Pie. Be sure to check out my other card I made for this challenge! Click here to view Popped Twick or Tweet.